Integrated Performance Resources, Inc., includes a team of talented professionals dedicated to the design, development and delivery of HR Development, Performance and Training solutions to meet the emerging business needs of our customers. The principal partner, Gary Sapir has provided organizational development and training and development services to both Fortune 500 and smaller regional companies for more than 20 years. 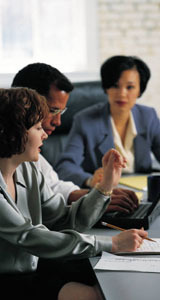 We offer our professional services to support you in achieving your organizational goals. Based on our extensive experience working with public and private sector companies, we provide our expertise to accomplish your human resources, organizational development and training and development objectives. Custom designed programs are our specialty. Many of our clients continue to use our services because we deliver solutions that have measurable results. And our clients span companies in manufacturing, service, hospitality, medical, education and many other industries. We provide leading organizations with solutions to increase employee performance, satisfaction and success. Our model links employee performance and satisfaction to organizational success and we provide organizations with tools to help achieve sustainable performance results.